Disclosure: Links marked with (eBay⇒) or (Amazon⇒) are affiliate links. This means I get paid a small commission if you buy something after clicking on the links. This money helps to pay for the running of the website. The first stage to a DIY van conversion is planning. In my experience, this takes nearly as long as the conversion itself! However, as they say in war, ‘time spent in reconnaissance is seldom wasted’. The same is certainly true of planning, although there does come a time when you have to just start – even if you do still have a few loose ends to sort out. 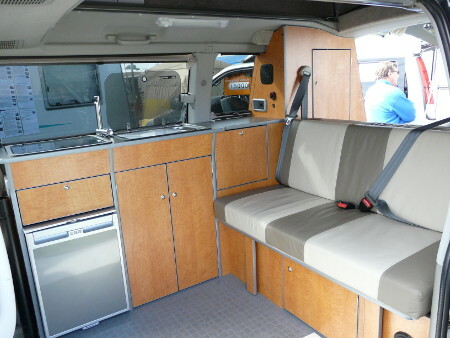 In planning my conversions I have considered all sorts of layouts, debated whether to make the furniture myself or have a converter build the furniture unit and taken research trips to motorhome shows. Basic electrics – cold tap (eBay⇒) /water pump (eBay⇒), LED lights (eBay⇒) and an inverter (eBay⇒) to run mobile phone chargers and a 240V fridge (of which more later). Two motorhome/caravan type windows (eBay⇒) – proper double-glazed, opening windows with built-in blinds and flyscreens, not single-glazed glass vehicle windows. Once you’ve decided on your specification, it’s time to start buying supplies – here’s a list of suppliers I have used and would recommend as a starting point. Disclaimer: All material is provided for information purposes and is my opinion only. I can take no responsibility for the accuracy, suitability, reliability or safety of the information in this guide. We’ve just bought a 2009 VW MWB Crafter with a view to converting. Looking for ideas! How have you got on with your Crafter conversion? I am looking for something similar to buy.